The old Jenkins bridge on Farm Road 1215 is pictured above. The bridge was closed around two years ago when MoDOT recommended its closure to the Barry County commissioners. The fate of the bridge will be decided after a public meeting at the Clio Community Building on Tuesday, February 19, at 6:30 p.m.
Two years ago, the old bridge in Jenkins was closed. While the bridge that spanned Flat Creek was a popular meeting and swimming spot, the bridge was in bad shape. MoDOT issued a notice to the county commission telling them to close it. 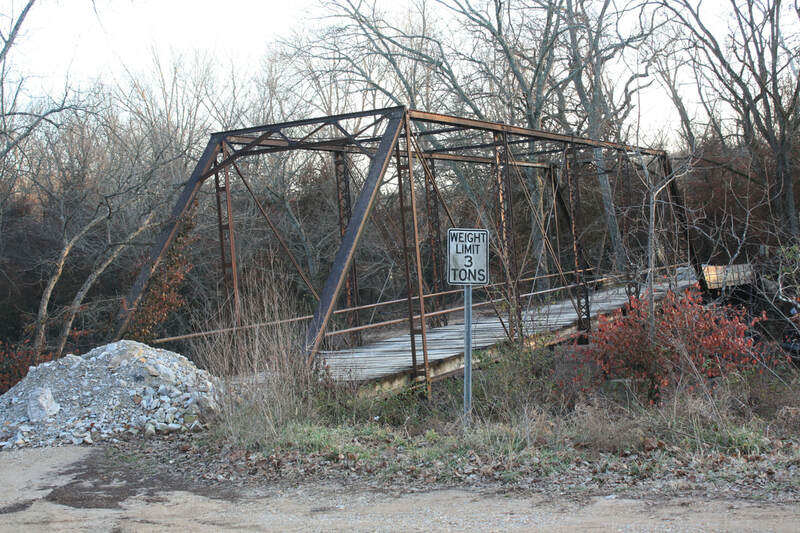 Now, a public meeting is slated to determine the fate of the old Jenkins bridge on Farm Road 1215. The meeting will be held in the Clio Community Building on Tuesday, February 19, 6:30 p.m.
Barry County northern commissioner Gary Schad said the meeting is aimed at collecting public input regarding the fate of the bridge and what citizens would have the commissioners decide. Options for the bridge are: demolition, offering it for sale to a private party or group or selling it to be de-constructed and taken off site. Schad said, "We're having the meeting so that anyone who is interested in saying something or has a concern can speak up. We'll have our engineer there to have explain the deficiencies in it and why we're not repairing it. The engineer will also go over what would be needed for it to qualify as a pedestrian bridge." Of the options, the most conservative financial option would be to sell the bridge. Schad said, "We're open to sell the bridge if there is interest. We'd heard from one person that there was interest by someone in buying it, but whether that is true or not, I'm not sure. They could take it apart and put it back together however they want to somewhere else." Schad said the demolition option would cost the county around $20,000. If the bridge were bought and converted into a pedestrian bridge, improvements would have to be made to comply with all state guidelines and statutes. All future maintenance would also have to be funded privately if the bridge were sold to a private person or group. The primary reason the bridge was decommissioned to begin with was because the cost to rehabilitate the structure was more than the commission deemed was reasonable to pay. Schad explained, "It's been in a bad situation for awhile, but it's one of those bridges that there are alternate routes around that area. It's a bridge that the county commission deemed that it's just not worth spending anywhere from $150,000 to $350,000 to replace. We feel like that money could be spent on higher priority places." Schad said so far, the commission hasn't gotten much feedback on the bridge. He said, "We've only heard back from a couple people interested in the bridge meeting, but we want to make sure they will be heard on how they feel." The meeting will be held at the Clio Community Building on Highway 39 near the intersection with Highway 248, on Tuesday, February 19, at 6:30 p.m.
For those unable to attend the meeting who want to submit an opinion, the county commission's mailing address is 700 Main Street, Suite 2, Cassville, MO 65625.